As Ufologists we hear many stories of unusual encounters and sightings of exotic crafts flying through our day and night skies. Every once in a while we come across a case that truly defies explanation. This is one of those cases I am writing about now. I was contacted recently and was sent a couple of photos of something unusual. At least for now it remains unexplained. At first the conversation started over the object itself but what I didn't realize was, that there was a lot more to come. This story comes from a man by the name of John Tosti who resides in the southern part of Bloomington, Indiana on acreage in a rural setting and who has lived in the area for many years. Back in his younger days he was an avid hunter and enjoyed being in the outdoors. John would leave his home roughly around 4:00 to 5:00 a.m., before the sun had risen so he could get to the back of his property in hopes of spotting game. One day as he made ready to head out, John walked onto his front porch and quickly noticed three bright spherical shaped lights which appeared to be floating above the top of the trees. One of the lights travelled to the west. This first light wasn't moving erratically and was flying along rather slowly. The color of the light was blue. The light at arms length was approximately the size of a quarter and the other two lights the size of a dime. These two were green and red and were moving erratically around the blue light in a figure eight pattern. They were slightly smaller than the blue lights. The objects were low enough in altitude that they cast their light onto the trees. An estimate of the distance away from the witness would have placed the lights at around 100 yards away from him. John said he watched them move along slowly for approximately three to four minutes before they disappeared. He stood watching and was totally baffled at the strange sight. John explained he had never observed anything like this before. He said that he has seen all types of different aircraft and helicopters and knows what they sound and look like. These lights made no sound whatsoever. He eventually made his way back home. He woke up his fiancée to tell her what he had just witnessed. Still half asleep John's fiancée listened with a puzzled look on her face as she didn't understand what he'd seen. He went into more detail about the sighting and took her outside in the cool early morning. He pointed in the direction where he saw the lights. They both stood outside discussing it for a few minutes and eventually she went back inside and back to bed. John sat down on the couch to reflect on what he just had witnessed. Later that day John talked with a couple of co-workers at the construction site about different things. He made arrangements with his close friend Jim to go out hunting the next day. John woke up early the next morning ready for the days hunt. His friend Jim pulled up at approximately 4:00 - 4:30 a.m. Both men sat outside pulling on their gear and getting things prepared for the hike to the back of the property. Once again John looked skywards and was surprised to see the same lights were back in the same area performing the same maneuvers. Jim sat there observing, not saying much at all, then finally he turned to John and asked, "what the heck is that ?" John told his friend that he had no idea what these objects were. He explained he had witnessed the very same thing a day earlier. They both sat watching and looking at each other from time to time and finally shrugged their shoulders and carried on with what they had planned for the morning. Both turned on their flashlights and headed off towards the back end of the property. Both men were approximately mid-way through the property when they came to a small creek which runs along the side of a hill. John was the first to notice an orange/red glowing ball in the distance in a forested area in the gully. Knowing there was nothing back there to cause this light source he thought it might have been the setting moon, as this was the first thought that came to his mind. The men continued walking, went up the hill and towards the bright colored ball of light which now they saw was sitting in the gully. From their position on the hill all of a sudden they saw the ball of light blink out. Now the two hunters stood baffled, amazed, and nervous at what they both had just seen. As they looked toward the area where they saw the ball of light there appeared two single lights. John's first thoughts were that a couple of hunters were wearing a strap-on light band around their heads, or miners with the light on their hard hats. But two figures were down in the gully where the orange light was. They were coming in the direction of John and Jim. Thinking they may be hunters and not wanting to be mistaken for a wild animal and being shot at, John told his friend Jim to get behind one of the larger trees which was close to them. Both men laid down on the ground staying silent and keeping out of sight from the figures that were approaching their location. John would peek around the tree to see if the figures were still heading in their direction as they were able to hear the dry leaves crackling and small branches snapping which indicated the two unknowns were getting closer by the second. John guessed the figures may have been 30 yards away at this point. He turned and whispered to Jim telling him again to be very quiet as these unknowns were getting very close and were heading straight for the two men. Just as John finished speaking to his friend he peered around the tree once more and the two figures were standing right over top of them. The approximately six foot tall figures came around the tree and shone their lights down on the two men. John thought, "who are these men, what are they doing on private property and what do they want?" He was frightened! John was blinded for a moment from the light. The next thing he knew, it was daytime. John said when he became aware of his surroundings he was approximately fifty feet away from where they were hiding. Both of their guns were gone. They were nowhere to be seen. Jim was approximately 50 yards away from John, across the creek in a brier patch, waving to him. John had a sharp pain in his nasal passage and a bloody nose with blood trickling from his left nostril. He told me it felt as if it was a dream because the two men had just been walking through the area in the darkness only to witness a bright glowing object and the two figures, then all of a sudden it is daylight. He was really confused about what had taken place. The fellows dazed, and confused, started looking around for their guns. John noticed an unusual pile of leaves and went to investigate. Under the leaves were the men's guns. He said they had been covered over by something, or someone. The fellows gathered up their gear and headed back home. When they got to the barn on John's property they removed the items they had taken out with them. Jim spoke up and said,"I don't know what happened to you and I, but I don't want to discuss this ever again." John told Jim, "don't worry about me talking about it as I would not even know what to tell someone." John said "I don't know what took place!" John told me that he definitely had a missing time event; how much time the two men lost, no one could determine due to them still feeling confused and not looking at their watches. Like John said, he never had given much thought about UFOs, Aliens, Abductions or anything of that nature. Back home, John tried to explain to his fiancée what he and his friend Jim had experienced. Of course, John found it hard to tell his story as he was still at a loss as to what had happened to himself and his friend. After John told her what he was able to remember, she was just as confused. Later that evening John went to bed and after falling asleep he began to have a series of nightmares about himself and Jim being back in the area where the encounter had taken place, plus what they went through. As the nights passed, John continued to have the same nightmare about their experience. Because these nightmares kept playing out night after night John decided to seek out some help. As he told me, he did not know who to turn to. He did not want to speak to his family members about what happened as he thought they certainly would not believe him and most likely wouldn't understand what he was talking about. He waited, or put the whole issue off, for six years. Eventually as the years passed, it was time to seek out professional help from a qualified medical person. John continued talking to his fiancée about what took place. Over the course of a year or more after the initial sighting, and encounter, more sightings took place. At this point in the conversation with John, he was asked how his relationship with Jim was to date. John told me that the two of them had pretty much drifted apart. He also went on to say there were other friends who had been with him on other occasions and they also had witnessed some of the lights/objects John was seeing. These friends also started staying away from him. John's fiancée couldn't take it anymore and left due to the high strangeness which was continuing to play out around their home. The couple had a baby boy and John's fiancée felt is wasn't a good idea to bring the young child up in this type of environment. John told me it was devastating for him to lose the people who were the closest to him. The sad fact in this part of the story is that John's fiancée did not want to have any contact with him after she left. John was not to have any contact with "his" child. Legal proceedings were started by his fiancée to keep John away from his child, which I find extremely sad. She thought that John was going crazy. John gave examples of the things he was observing around him. As he told me, he was seeing these lights/objects around his property on a continuing basis. He witnessed these unknowns pretty much over the same area on the acreage and he began to chase after the objects down the country roads. John felt as if these objects were leading him to certain spots on the property, maybe setting him up for something yet to come. Even throughout it all he still thought how beautiful the balls of lights were and how they moved so gracefully through the sky. He was chasing after them because he was hoping to find an answer to all of this phenomena. Sometimes there was just one light, sometimes there were two. John said as he chased these lights he would be brought to an old farm where the unknowns would sit stationary and eventually just disappear. It seems that John would be constantly chasing these lights night after night to only see them vanish before his eyes. (Note: the old farm mentioned above is actually owned by the goverment). Of course at this point in John's life he was living on his own. He met a wonderful lady some months down the road after his break up with his fiancée. Early in their relationship John figured he would share some of the things he had witnessed with his new lady. John cared for his new found love. He wanted her to see these things so she didn't think he was making up these stories. It worked out well as she told John that she also had seen something in the past but wasn't sure what it was. So she had an interest in all of this. The couple took a drive out on one of the country roads so John would be able to let her see for herself the sights he'd been observing for months. The two of them made their way down to the old farm and sat there. John started to point out what appeared to look like shooting stars, except these lights/objects would come all the way down through the sky and stop over top of the tree line and move diagonally either to the right or the left. The lady sat there with her mouth wide open as she watched. She didn't know what to say as she was in shock to actually see this unfolding in front of her. John at this point is feeling much better about the whole situation because he had been talking a little about this, and now the new love in his life didn't consider him to be crazy !! They both watched the lights dance around the sky for approximately an hour. Suddenly the interior lights of their car started to flicker off and on. She mentioned to John that this had never happened to her car before. Finally they decided to head back home and talk about the event they had both witnessed. Discussing the nights events, she decided it would be good if they got a video camera so this could all be documented. She told John that no one would believe us, we need proof in the form of footage or still pictures. He certainly agreed that it was a good idea to get a camera, if for nothing else than to capture these objects and then show the footage to their other family members. It was very important for them to believe John. Susan bought a video camera on December 23, and that night John ended up chasing a ball of light down the same country road to the farm where the lights have been so visible on a constant basis. He started filming two balls of light which were low over the trees. After approximately fifteen minutes of filming them, he thought he had enough footage to take back home to share with his family. He arrived at his house. Shut the vehicle off and walked inside. Susan appeared to be upset about something. She turned to him and asked "where have you been for about five hours". John was shocked to hear this as he knew he had only been filming for a short period of time. The couple ended up in an argument over the length of time he'd been gone as Susan was only concerned for her husband's well-being. She finally told him to look at the clock. The time was 4:30 a.m.! John had left at 11:00 p.m. and thought he was only gone for approximately fifteen minutes. After he looked at the clock he realized why his wife was so upset with him. "I just don't understand where the time has gone" he said. Eventually things calmed down and he asked his wife to look at the video tape of what he had captured. Both of them settled in to watch the video footage so he could prove to Susan that he was only gone for the 15 minutes and not out doing something else. While viewing the tape he excused himself as he had to use the washroom. As he was about to enter the bathroom his wife, Susan, yelled out, "what is that?" John turned around to find out what she was referring to. What she observed on the film was a red "thing" which appeared on the upper portion of the TV screen. He walked back and sat down beside her and they rolled the tape back a little so they could replay it and watch for the red "thing" that she had noticed. John describes this thing as being wand or rod-like in shape. It went through his hand which was in view of the camera. Inside the red rod there appeared to be a white tube which extended down through and out the end of the red rod. Once the white tube reached the end of the red rod the entire apparatus moved rapidly back through John's hand. At that very moment John recalled some type of cloth rubbing together and his arm started to go numb. He immediately got up from the couch and started pacing the floor coming to the realization that something had happened to him when he was out taking footage of the lights at the old farm house earlier that evening. John was finding it very hard to have a good night's sleep because of what had been going on. The couple just had a baby girl and John was certainly worried about the unknown lights around the home and wondering for the safety of his new born child and his wife. Plus the lights were starting to show up in the daylight hours which was really getting them all stressed out. One example he gave was when his mother-in-law was in one of the rooms above the main floor of the home and saw a ball of fire drop out of the sky and shoot lightening bolts at the home. Another was of a shimmering blue/white light which constantly showed up in the families backyard. John, not knowing what might happen, would stay up all night until the sun rose the next morning. He finally went to see his family physician to ask for something that might help him get a good night's sleep. The mother-in-law who saw the ball of fire shoot the lightening bolts towards the home was a skeptic. She did not believe in UFOs, or beings from elsewhere. Matter of fact, she had been holding a cup of coffee when the bolts hit the side of the house and becoming very frightened, she spilt the hot coffee all over her chest. The lady was so scared that she dropped to the ground and crawled underneath a table and stayed there until her daughter and son-in-law came home. She had no idea what happened and no rational explanation for it. John and his wife were at another house on the property and had witnessed an extremely bright flash and first thought electrical lines might have fallen onto the residence as they could hear the sound of an electrical rush of current or discharge. As they entered the house the flash of light and the sound kept repeating itself over and over as the couple walked through each room looking for John's mother-in-law. Finally they found her hiding underneath the table. Later she told her them that the flash and sound seemed to be moving around the outside of the home following John and Susan in and out of each room. The couple could clearly see the flashing and hear the sound of high voltage going through the roof as they made their way through the different rooms. As mentioned above John sought help so he might get a good nights sleep. With all the visitations happening on a daily basis, he wasn't sure if his family was going to be next, or taken, or harmed in some way. It became so bad that he had his family sleep/hide in the closet at night and he guarded the door. John was worn out. He had lost an excellent job working in construction, etc. He needed professional help at this time. He talked to a lady (she was a director of Mental Health at one of the local hospitals) in hopes he might get a little medication to help him sleep through the night, thinking this may work or at least help him to some degree. The lady suggested that John and her go talk to a doctor to see what could be done for him, in the way of some medication. The lady asked what was going on, and John thought that just maybe if he told her she might have a better understanding and know what exactly should be done for him. She walked with John over to the hospital, (there are two buildings on the property). At one of the buildings they evaluate potential patients and at the other building patient care is handled). When the lady and John entered one of the buildings, they immediately got into the elevator and the lady mentioned to John we are just going up to see the doctor, plus you can tell him what has been taking place at your home. When John and the lady arrived at the fifth floor, the elevator doors opened. As he stepped out he noticed two men dressed in white hospital clothing approaching him. He was wondering what was going on as the two men were looking directly at him which made him feel very nervous. He then turned to ask the lady what was going on when he saw her back step into the elevator as he watched the elevator doors close. Feeling frightened at this point John looked over to where one would push buttons for the elevator which would take you to different floors in the hospital, but he noticed that the elevator was operated by keys only. In other words John was stuck, scared, with nowhere to go. The two men took hold of John and said that they were going to take him to have his vitals checked, etc.. While this is being done John said to the men that he was just here to see the doctor. One of the men who greeted John told him that the doctor was not going to be back to the hospital until tomorrow morning and informed him that he would have to spend the night at the hospital. Of course straight away John starts to question what is going on. From the sounds of it the lady may have called ahead to the hospital to have John committed for an evaluation, and the two men did confirm this to John. Being cooperative John asked could he please make a telephone call to his wife as she was going to be worried sick about him because she had no clue that he would be kept overnight. The hospital staff allowed John to call home and talk to his wife. When Susan found out where her husband was she was totally upset and surprised. He explained that there was no way the hospital staff was going to let him out. He was basically stuck there, at least until the next day. They had no idea what would come after his meeting with the doctor. John settled in for the night waiting until morning when the doctor arrived to evaluate him. Susan also arrived at the hospital with some of the video footage that they had taken of the strange occurrences from around their home and explained to the lady who got John into this pickle that he wasn't delusional or crazy and everything he had told her was true. She pleaded with the lady to allow her to show the doctor what was on the videos. The lady walked Susan over to the hospital and they waited in a room to see the doctor. John, the lady and Susan would be discussing the case. Before he was to meet with everyone he was given a shot which made him lightheaded. He guessed it was a sedative of some kind. When he was escorted into the meeting room there were three doctors waiting. A TV and VCR were hooked up so everyone would be able to view the tapes Susan had brought with her. One of the tapes was placed into the VCR and everyone watched for approximately 5 minutes. The video machine was then turned off and the doctors consulted and looked at John and said, Mr. Tosti, we are sorry but there is nothing we can do for you. So they signed his release papers and John and Susan left the hospital. Caption for Above Medical Document: Medical record gives evidence that John was indeed placed into a hospital for possible treatment. Due to having the footage of what John's family had filmed and the doctors viewing the tapes they came to the conclusions that something was definitely happening over and around the Tosti home. I am Johns wife, Susan. I'd like to talk a bit about what happened after his trip to the mental hospital. We found out what would happen if we sought help. John thought the best way to stop what was happening to us would be to throw all of the evidence away. Needless to say I didn't agree and we were having a rather heated argument. In the midst of our quarreling a blinding light shot through the window we were sitting next to. It was just like a bolt of lightning and it sounded like 40,000 volts of electricity on the ceiling. However, there was a blizzard occurring at the time so that definitely wasn't it. We both jumped up and ran into the kitchen to get away from it. As soon as we got to the kitchen it happened again. But this time it came through the kitchen window we were closest to. So we ran to the very back room of our house where there was an outside door. We were going to exit the house. When we went to open the door it came in through the window in the door at us. Each time this happened the sound of electricity was deafening. We thought a power-line had dropped on our house so we called the power company to help us get out of our house. The snow wasn't that deep yet and they made it. To our surprise they said there wasn't a thing wrong. However we did notice that the snow that had fallen so far had holes melted in it as if there had been sparks falling all around our house. That night we were terrorized and it continued every night for about five days. We would first lose our electricity. This always adds an extra element of terror. Then you realize you are not alone. Bright blue strobe lights or bright white lights from outside would light up our house and sometimes we would see others in the house with us. One time they were in my bedroom with me and one grabbed my leg and tried to pull me off the bed. I didn't appreciate it too much. My husband also saw a few others but he can tell you about them. I was very scared and I didn't know how we were going to go on. After the blizzard was over and the state of emergency in our county was lifted things got better. But they were still there above our house every night for the longest time and I never knew when they were going to start terrorizing us again. It was not a good time and I feel for anyone that has experienced this. John has pulled together some eight to ten hours of footage of these strange lights, etc. Also there is the medical form on which it states that John was in the hospital at the time he mentioned. Also since all the strangeness has been taking place there, John's family have observed many helicopters flying close and over the top of his home when they never showed up before. He has footage and stills of the fly by. Because things were so frightening and not sure what the government might or might not do, John and his family talked to reporters who came to visit their home and related their story to them. The idea was if the information gets into the public eye then government officials would leave them alone if this should ever be a problem. John has filmed military jets flying low over the roads. After he played back the video tape of the aircraft he could clearly see a wobbling object of some kind which was flying directly below one of the jet aircraft. Later that day he went over to a friend's home and saw something with a shape flying over top of his friends house above the tree line. He told me the camera was set at a high shutter speed. Also military helicopters were buzzing the families home on many occasions. One of John's most memorable videos captured an object that was a moon sized craft that was vertical in the sky and approximately 200 to 300 feet off the ground. John could easily see a number of separate lights on the bottom of the craft. As the object started to lean towards John's direction or location he was able to see a dome towards the back part of the craft as the rim of the object became more visible. The dome portion of it was a blue/white color. As the object started to pitch down in front of John he turned on the vehicle's headlights to brighten up the area. What he wanted to accomplish was to provide some trees, the long grass etc.. which would show up on the video and give some perspective to show just how low the object was, and to give a good idea of what it looked like and how it maneuvered. As soon as the lights from John's vehicle were turned on, the craft flattened out and dropped down towards the ground with the dome and other features clearly visible. All of a sudden the bottom of the craft starts flashing until eventually the whole craft starts to flash. As he watches, the object starts to move to his left, which would have been towards the south. Still visible by sight and camera, the object came to a complete stop and hovers. From there it starts to change it's form/shape and moves back to John's right and behind a tree. From there it releases two smaller objects which are red and the other green. These two colored objects were round in shape. As John watched the large object move again to his left/south he lost sight of the two smaller ones. Keep in mind that he had still been filming and caught the object changing it's form. As it reached a point to his left the large craft started to flash. As John zooms in on the large object the two smaller objects reappeared. One of the smaller objects went to the top of the craft while the other object positioned itself at the bottom. He could clearly see there were three separate objects and that none of them were attached to one another. This piece of footage was shot on January 19, 1996. John estimates the craft to be approximately 500 yards away from his location. He also estimates (roughly) the object may have been some 35 feet in diameter. After all this being caught on film it was a relief for John to be able to show his whole family that he was not crazy and was certainly seeing all that he was talking about. The unusual events that have taken place at the Tosti home are still continuing to this day but it comes in patterns over a period of time, then the sightings subside to some degree. When the lights or sightings flare up John notices there are regular military over flights of the area. I thought we would send some more evidence pertaining to our sightings and visitations. The article attached is from our local newspaper in Bloomington called "The Herald Times". This occurred when we were having many encounters. We obviously weren't the only ones that saw strange occurrences. There is a man who claims he witnessed a plane crash in the woods. This man first saw landing lights of an airplane. Shortly thereafter he saw a fireball and heard an explosion. Two other people also heard the explosion. This site is only 3-4 miles from our house with nothing in between but a lake and woodland. Department of Natural Resources Officer Steve McClain concluded that someone could have exploded a home-made bomb or gasoline but yet "nothing out of the ordinary was found". There wasn't any scorched earth or trees nor was there a strong odor of gas. Seems to me that would have been very noticeable. Even if what Officer McClain concluded was true( which I strongly doubt), it doesn't explain the landing lights the man saw in the air and the fireball with a huge explosion. Corp. Rick Wright said "The man saw something. We just don't know what he saw." I don't know if John told you about the last couple days, two nights ago John noticed lights up in the sky, the dogs were going nuts over here. John and I live about 1 1/2 miles apart now, so when he or I see something outside we can both usually see it from our places unless their low to the ground. But yesterday, there was 3 F-16's flying over town, 1 up front and 2 behind, way below the required 10,000 feet level. They were about 1500 feet off the ground, as I headed back home I lost sight of them. When I got there, my neighbor said he heard them, then saw them flying around in circles like they were "looking or chasing" something, then about 10 minutes later Alice heard a helicopter. I looked outside and saw it was a Black Hawk with a gun port on the side. I called (name removed) out to see it as well. That is when I went to John's to work on sending you the photos, and on the drive to Johns, 5 military vehicles came rushing down the road in the opposite direction... 1 Humvee with a red light on the dash, 3 troop carriers with the tarps pulled over them, and another Humvee following. Johns wife saw a helicopter hover over their house as well. Interesting things going on around here as of late. More photos and footage will be added as I go along with this story, so please do check back from time to time. HBCC UFO Research Note: I would like to extend my many thanks to the Tosti family. It takes alot of courage to come forward and tell about the ongoing events which has taken place around their home in Bloomington, Indiana over the years. I would also like to add that the strange lights/objects can still be seen from time to time around the Tosti home. It hasn't ended ! 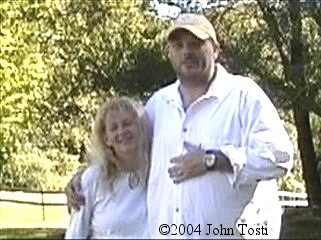 Please note all footage is ©2004 John Tosti. Also I would like to thank Mr. Gabe Torok for all his help in getting the video footage reformatted into an extension in which could be viewed on my site. Dr. Johnstone's book was selected by The Anomalous Book List, as one of the ten best UFO books of 2002. Description: The existence of UFOs is a phenomenon that intrigues and captivates, yet it generates more skepticism than acceptance. Witnesses of unconventional craft are often disbelieved and even ridiculed. Belief in the existence of UFOs is obviously not yet mainstream, but that may one day change. Over the past few decades, reports of UFO sightings have dramatically increased in North America. Further, these sightings have been observed to be more blatant and even menacing. Some reports even imply that these craft are monitoring our planet. Interestingly, many of these sightings have taken place over military bases. In UFO Weather Shield, A.K. Johnstone, PhD., explores the details of numerous sightings from a scientific viewpoint, including descriptions of craft, luminous sheaths and fireballs. So what, if anything, is the United States government doing about it? Johnstone suggests that military and government agencies have the ability to manipulate weather electromagnetically and with chemtrails to deter unconventional craft. This hypothesis also explains erratic changes in the weather in the last few years. Is the government creating a weather shield to deter UFOs from entering the earth's atmosphere? Take a look at the evidence.